A two-year-old child was crushed to death when a bookcase she was climbing on tipped over and fell on top of her. An investigation by the state’s Department of Human Services found two reasons responsible for this avoidable tragedy. They ruled the daycare center was at fault for failing to watch the child properly. They also noted in their investigation that the bookcase was unsafe due to overloading of the shelves and that it should have been anchored securely to the wall. Falling shelves and bookcases are a common problem in child care settings. The children’s attraction to these hazards in understandable since they often contain books, toys, aquariums, and more entertaining items designed for their enjoyment. Also, young children enjoy climbing and look at these places as indoor playground equipment. Shelves, bookcases, tables, and all kinds of furniture pose two distinct hazards to children. The first hazard is crushing children under the furniture as discussed in the story above. The second type of hazard is when children pull, push, or slide heavy objects off and onto themselves or others. This hazard is particularly important when items like aquariums, animal cages, televisions and slow cookers used for heating formula are not properly secured. Securing and organizing potentially dangerous furniture is a critical step in ensuring children are safe in any setting, but it is especially important in child care centers. Secure all bookcases to the wall. 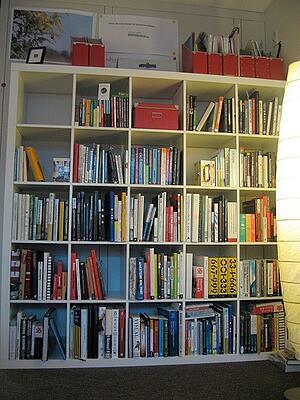 Bookcases and shelving units can be permanently attached to walls using brackets, screws, or bolts. Doing so removes the hazard of them tipping over. Make sure they are secured on all sides and regularly check to make sure the fasteners do not come loose. Fasten all large, heavy objects directly to the surface. Items such as straps, Velcro, brackets, and adhesives can be used to attach heavy items directly to surfaces. Keeping heavy items including aquariums, televisions, animals cages, and more affixed directly to surfaces eliminates the hazard of children pushing, pulling, or sliding them off onto themselves or other children. Place the largest/heaviest items on the lowest shelves. Keeping the heaviest items on the bottom shelves aids in both stabilizing the unit and preventing heavy objects from being pulled on top of children. These items should still be fixed to the surface if they are not meant to be removed. Stabilize bookcases not against the wall. The best way to do this is to attach them back-to-back. This will create a much larger surface area on the floor and make them much more difficult to tip over. This should only be done if wall space is unavailable to attach them to. Ledge barriers can be useful in preventing heavy items from being pulled from shelves. These easily installed barriers placed around the edges create a raised edge and encloses the surface area which prevents items from sliding over them. Mount televisions to the ceiling. Televisions are one of the most popular items used by children and can pose a serious hazard. If televisions are within reach of children they may attempt to change channels or push buttons. Also, they may attempt to climb on whatever they are placed on as a way of getting closer. The only way to remove all potential of a television getting pulled on top of a child is to mount it securely to the ceiling where no child will have access to it. Cabinet doors can easily be pulled open by children and spill their contents which could fall on and harm children. These devices prevent cabinet doors from opening randomly and ensure their contents are safe inside. Mount pictures and bulletin boards properly. Many daycare facilities use bulletin boards to display children’s artwork or post announcements, list a schedule, or various other important functions. 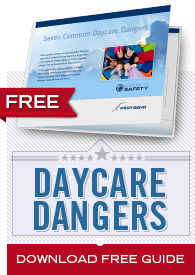 The danger with bulletin boards is that their content can attract small children who will then grab on the bottoms and possibly dislodge them causing it and its sharp corners to fall. The same scenario applies for pictures. It is important to fasten them to screws fixed to studs and to monitor their security regularly. Glass cages, aquariums, shelves, and anything else can greatly increase the damage if an item were to inadvertently fall on someone or the floor. Several glass substitutes remain and should always be used instead of glass.